How can we create a story, and make it come to life? 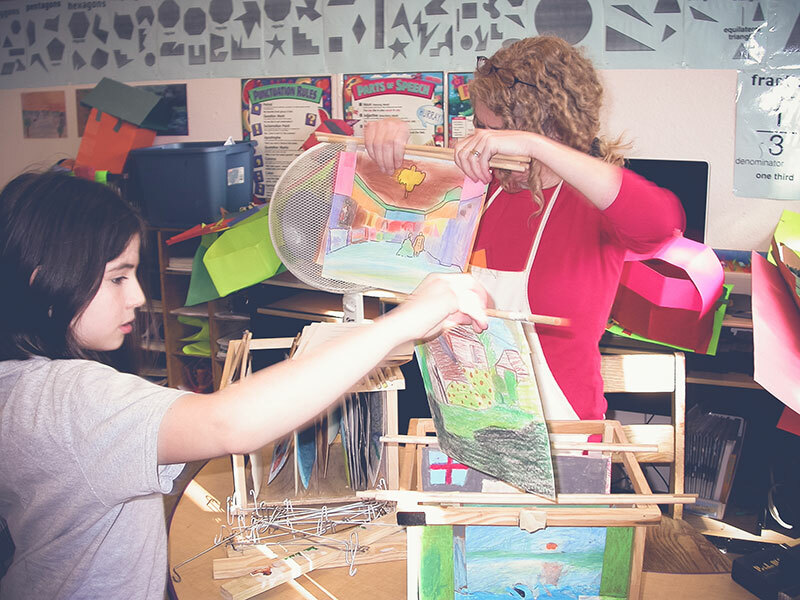 How can we effectively teach a variety of subjects using a non-traditional method promoting a deeper form of learning and incorporate visual and performing arts in the process? The art of toy theatre in the classroom explores how students can develop stories and ideas using accessible, inexpensive and low-tech materials to create highly creative, miniature visual performance. Exploring toy theatre provides learners the opportunities to problem solve from concept to finished project. Students are transformed into story- tellers, puppet designers, set designers, stage designers and performers. 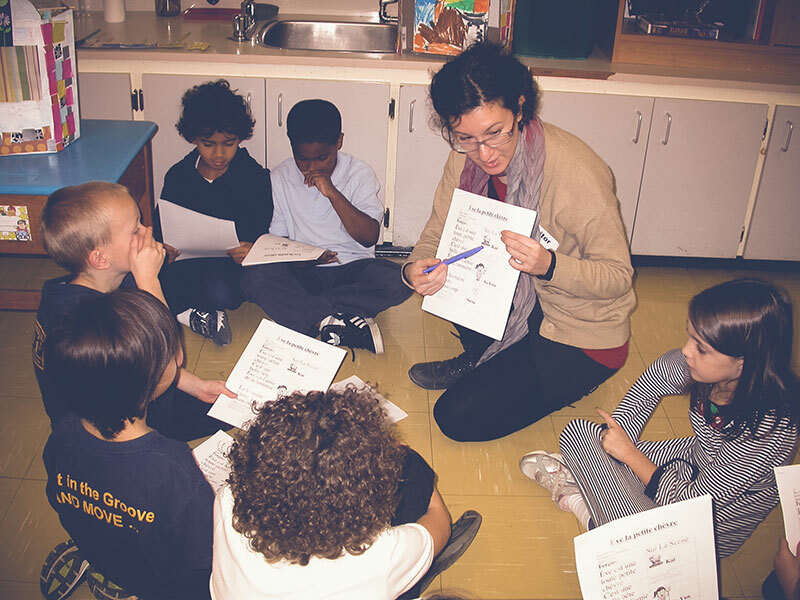 This article focuses on in-class examples of how toy theatre can be implemented into a language arts program and provide a rich, rewarding form of learning. My introduction to toy theatre was through a formal 5-day workshop given by a member of the Great Small Works toy theatre company. As I participated in the workshop, I quickly discovered how toy theatre could be used in primary school classrooms. So much so that I decided to propose a project to one of my son’s former teachers with myself as a volunteer facilitator. Because it was such a successful experience for all involved, (teachers, students and myself), I proposed it again to my co-operating teacher during one of my primary school teaching internships. 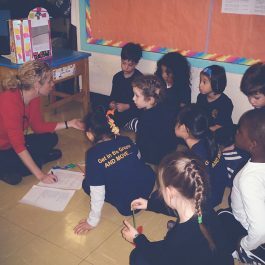 Each experience allowed me to re-evaluate and improve working methods and materials as well as the assessment process, which is important for the homeroom teacher. Drawing from my background as a graphic designer for over 20 years, painter (BFA Studio Art 1991), art educator (BFA Art Education 2012) and my growing passion for puppetry and toy theatre, I decided to approach a colleague who taught grade 1 and get back in contact with my son’s former English teacher to propose working with their students to create some unique toy theatre productions. 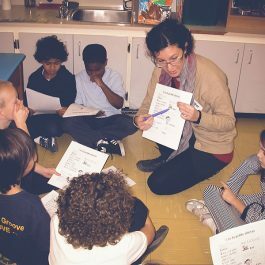 With experiences teaching in camp and after school programming, my colleague’s background also includes a BA in English Literature (theatre and cultural studies), a BFA in Art Education and several years experience as a facilitator in various creative programs for children including video. Her solid technique for helping guide students in their creative group projects was an asset for continued success with this project. Equally important was our like- minded pedagogical philosophies; emphasis on guiding students and letting them shine. We also share the personal reflection that as educators, every day we work on project like this we learn something new! As to our approach as work partners, we both took turns introducing projects and mentoring students through each step of the project. The primary teachers I approached were extremely enthusiastic to have us come into their classes as a team and work with their students. 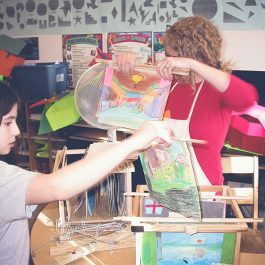 The beauty of toy theatre is that it can be tailored to both subject and grade level with the learning assessment focused on process. Students are evaluated based on active participation in creative problem solving, working individually and working as a team. All these assessment criteria were important for each teacher that we collaborated with, as this was not a concrete curriculum subject but rather, a relatively unique learning method that could be applied to various subjects. Besides, these toy theatre presentations went beyond the classroom and became a community experience and celebration where parents, other classes and administration could view the final product and see the both the artwork and performance proudly presented at a formal vernissage. 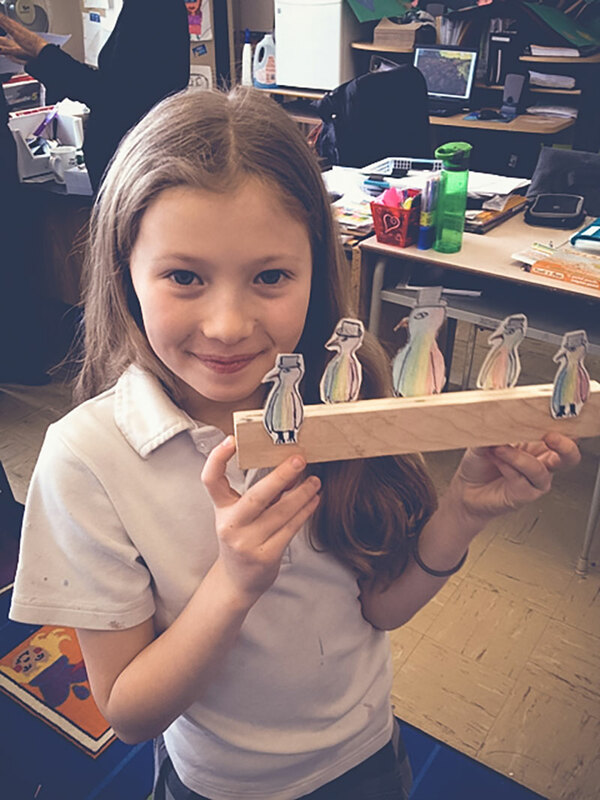 After several positive experiences working with a grade 5 class, I was happy to have the opportunity to work with a grade 1 class and see how toy theatre could be an equally rich learning experience for these younger learners. 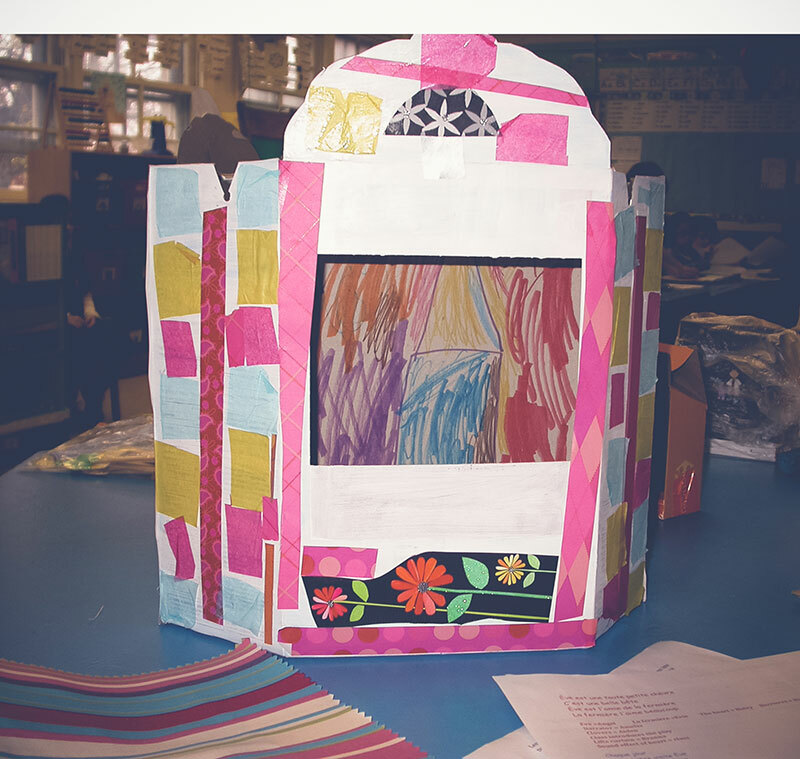 Working alongside with Nina Pariser, we decided to adapt the actual theatre – rather then use the wooden toy theatre, we therefore opted to use a simple, large cereal box as the base that the students were going to transform into their theatre. The learners in this particular class were English speakers in a FSL immersion classroom. After meeting with the homeroom teacher, we decided to use a story/exercise that she had already introduced to her class called ‘‘ Ève la petite chèvre”. A simple story exercise designed to teach accent grave in French language studies. After our introduction to the class, Nina and I explained that we were going to help the students turn this little story about Ève, into a little puppet theatre performance. In addition, we explained that with our help, they would create the puppets, backgrounds and theatre. The students’ reaction- excitement and curiosity as to how this was going to happen. We split the class into two groups and decided that each would create their own version of the same story. We were given approximately six 1-hour sessions with the children and then they were going to do a final performance for their other grade 1-class peers. With our support and guidance, the children were given the task of creating the character puppets using paper, cardboard, (for sturdy backings) markers and popsicle sticks to hold them with. Each child participated in designing the toy theatre. They decided on what should be the background image design that the puppets would be in front of and then a couple of students volunteered to create the background scene using tempera paint on a sturdy cardstock paper. The theatre and puppets required two classroom sessions. The other four sessions focused on puppeteering and performance. Each learner was given an opportunity to puppeteer and read the story after which, each student would decide what they felt most comfortable doing. The students were taught how to move the puppets on the stage, they learned to move the puppets in a sequence of actions that made up the story, and practiced focusing on when it would be their turn to perform as well as remembering how to move the puppets they were responsible for. All these efforts reinforced how practice was useful and necessary in order for a performance to take shape. Because this was a FSL language class, some students were still struggling with reading in French. However these same students shone as puppeteers. Other students felt more confident reading and in some cases, memorizing their parts. They read their lines with expression and pride., The most evident motivating factor for the class was realized when they knew that this project was to become a performance and so it was necessary that they all needed to work as a team. Key to the success of this performance was the enthusiasm and support of their generalist teacher who had her learners practice the performance on days we were not there. 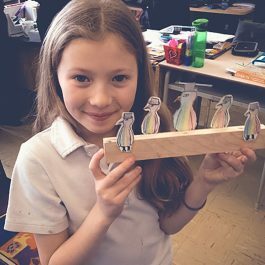 The following project was created by two grade 5 classes at a public French immersion school in the NDG borough of Montreal. The generalist teacher had decided to incorporate learning about toy theatre into her language arts program. 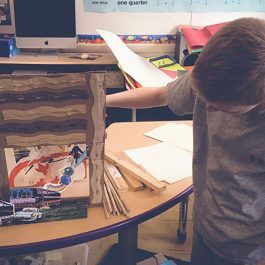 Scheduled to visit the impressionist exhibit at the Montreal Museum of Fine Arts, we decided that this toy theatre project would focus on the history of impressionism and post –impressionism providing a rich form of art appreciation. Students would be assessed on their story writing assignments, (a pre-curser to creating their final theatre script) as well as their active participation in each stage required in designing the final performance. Once they had visited the museum, Nina and I worked out a tentative weekly one-hour class schedule. We began the project in November and proposed to work with the classes until May. Our first few visits focused on introducing the classes to 5 post-impressionist paintings, (2 by Van Gogh, 2 by Seurat and 1 by Monet). Students were asked to look at the paintings closely and then reveal what they saw based on their sense of smell, hearing, touch and sight for all 5 of the artworks. We prepared a hand out of “Fun Facts” about each artist and the paintings. This was read and discussed in class. Discussion about the artists proved to be a hook that motivated the students to make comments, ask questions and openly discuss difficult issues, for example, the stigma and attitudes regarding mental illness, (when talking about Van Gogh). 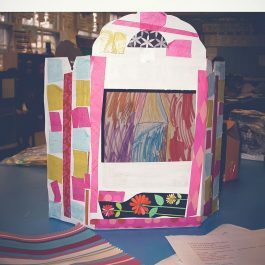 The following session, students were given a written in-class assignment answering very specific questions that would enable the students to develop a story based on information about the artist and artwork they would feature in their toy theatre production. For example we asked the students to pretend that they were their chosen artist – imagining where they were living and how they were living. The written assignment was to be a page long, personal journal style entry for what she or he did that day. The students were then divided into groups of five. Each group was given one of the five paintings that we focused on in class. 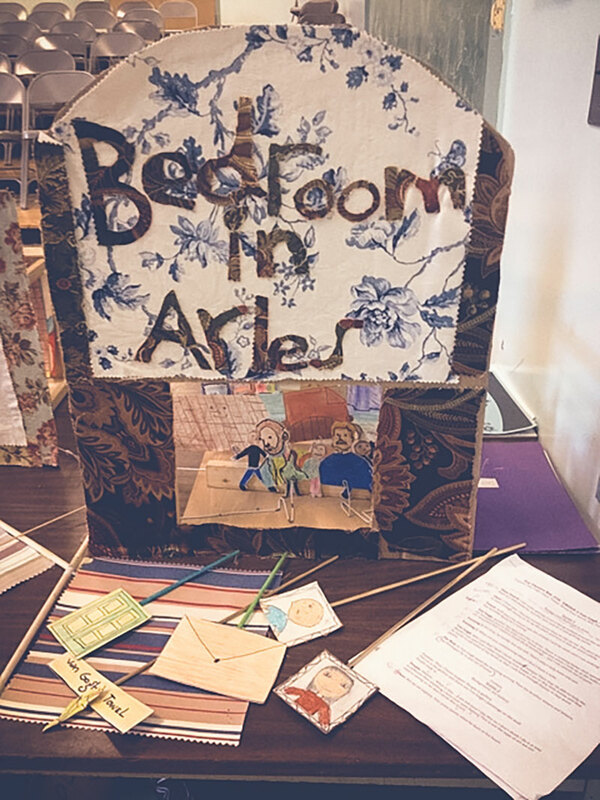 The students’ next written assignment was to create a story that would incorporate the artist, the artwork and some of the facts that they learned regarding the history behind the work. We emphasized to the students that these stories would then be turned into toy theatre performances as a means of teaching younger grades a little bit about art history. Once the stories were prepared, I introduced the students to the art of toy theatre with a power point, handouts as well as sharing completed examples of previous theatres created by other students of the same age that I invited my students to interact with. This was a time for students to ask questions about the various tasks that needed to be completed in order to achieve their final piece. Again, we worked in small groups who had each been given a storage box and folder to store their puppets, props, backdrops and script in. Some members of the groups began working on their puppets while other members would design the backdrops. For this particular class, they were encouraged to create depth by design 3 different backdrop panels that would make up the final backdrop display. Once again I supplied all the necessary materials which included the basic theatre structure, large, box -thickness board to create their prosceniums, card stock paper, markers, oil pastels, scissors, fabric for their theatre curtains, and even a portable mini light table. They were free to research images of their artist. 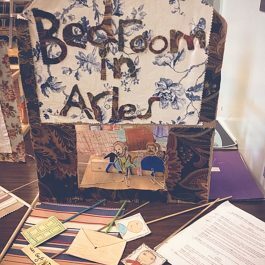 During this production period, some students felt more comfortable drawing the puppet characters, others more at ease with designing the prosceniums whilst others enjoyed creating the backgrounds and props. 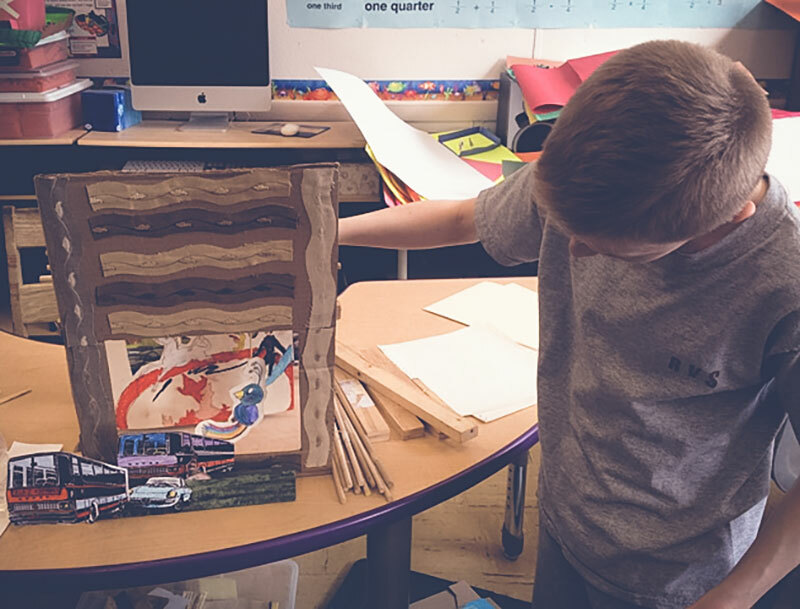 Students were given a variety of materials to create all the components of the project and while they created each element they simultaneously began to problem solve based on the criteria and conforms of their theatre and story. The beauty of working with a miniature theatre is that is allows the students to have a dual function -one as the artist and the other the audience. Part of the problem solving process associated with the students’ dual function involves having the students place the puppets and backdrops into the theatre. We asked students to come to the front of the theatre to judge how it looks from where the audience would view the stage. Some students were instructed to move the puppets whilst we asked others to observe from the front of the theatre so that they could observe for themselves as to whether what they produced is clear enough for them to understand. If this was not the case, then we encouraged students to alter the puppets’ movements so that the story would coherently unfold. Despite working in teams, on various occasions students belonging to different teams were quick to provide solutions to other team’s problems, these solutions were welcomed and this added a sense of solidarity and unity within the class. Hence, the classroom is now transformed in to a co-operative studio workshop setting. 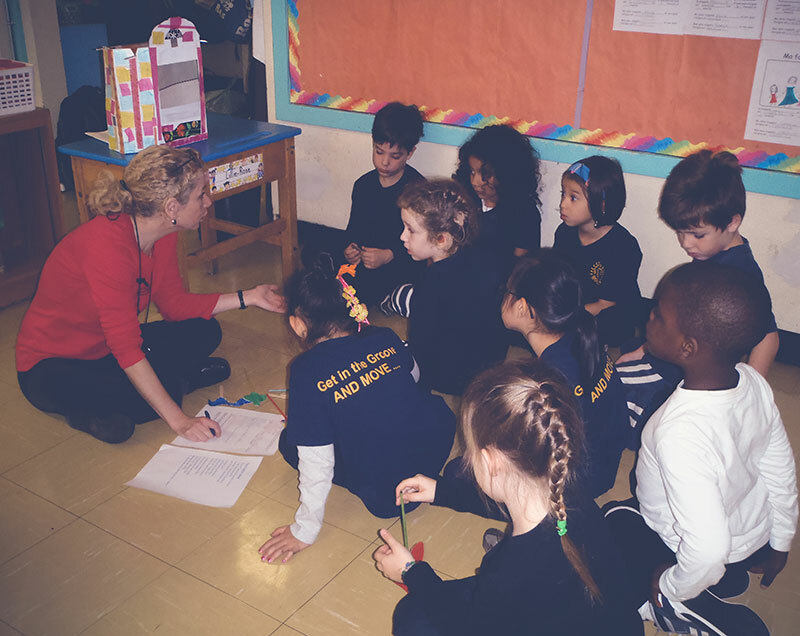 The toy theatre experience provided students an opportunity to experience collaborative work resulting in a mini theatre production that they presented to their peers. This involved practicing co-operation and learning to be respectful of each student’s ideas and contributions. As well, this type of creative collaborative work required learners to exercise kindness and compromise as a team and as a class. Finally, this project provided a strong sense of achievement. Through practice, learners develop a sense of confidence – be it acting out the characters, creating the sound effects or manipulating the puppets during the performance. This project offers an element of freedom in that each puppet is unique to each student. Where the final product can be experienced through the performance, the value of the work is in the process. In order to illustrate this, Nina, myself and the co-operating teacher make a point of documenting the process by photographing the children working to create a collage that can then be displayed in the school, (PowerPoint presentation) along with the final toy theatre performance and a display of all the visual elements created. Both the learners and co-operating teacher achieve a sense of pride when they have an opportunity to review the moments in time that were devoted to the project. Displaying the work through a formal presentation and vernissage strengthens school community as it is being shared with fellow students, teachers, parents and administration.